Summertime, when people all around the world go on vacation. Most will plan all year and build up this idyllic experience that should be in the movies. Days lolling on the sand, sun shining brightly, cookouts, ice cream cones and a juicy book in your hands, of course. Oh, and everyone must be very very happy to be together, even if you are not. Please pretend because we have painstakingly planned this trip for the whole family and happiness is required! Jim and Franny Post, a successful Manhattan couple, along with their 18 yr old daughter Sylvia and son Bobby, a 28 yr old realtor (who lives in Miami, along with his personal trainer girlfriend Carmen, who they'd rather not mention but have no choice) along with Charles and Lawrence, a couple they have known forever who are in the midst of an adoption struggle, are off to an island of Mallorca. They rent a magnificent house just steps from the beach and pray for two weeks of the idyllic described above. Unfortunately, not much ever goes exactly as planned. Sylvia is in an angry teenage phase, mostly having to do with her virginity, Bobby is drowning in debt and waiting to spring this on his parents while Carmen snidely observes the complicated dynamics simultaneously doing pushups and drinking protein shakes. Charles is supporting Franny who is mad at Jim, Lawrence is jealous of their friendship and anxious about the adoption. All the while Sylvia is after the gorgeous spanish tutor and Franny is frantically trying to bring them happiness by filling their stomachs with her scrumptious meals. European Vacation, minus Chevy Chase, this nutty family really does love each other, even if they don't always know it. 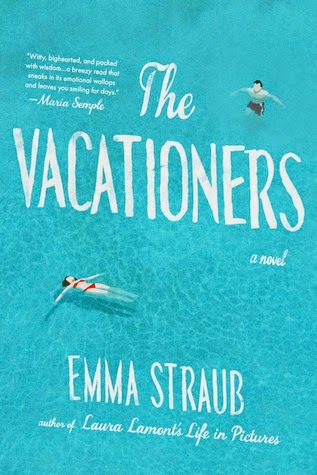 The Vacationers is a light, funny look at the ideal family vacation even as the family is in the midst of catastrophe. Loved the characters and Emma Straub writes with an ease all her own. Highly recommend this most perfect summer read, for the beach or the hammock or family vacation, if you can handle it!